In the field of signalling technology, there are four types of beacon, which each have differing levels of signalling effects. Strobe beacons emit an intense light pulse by flashing very quickly at intervals of milliseconds. This light pulse achieves the best signalling effect and attracts maximum attention. The xenon strobe beacon stores electrical energy in a capacitor and pushes it out through a xenon flashtube in bursts, which generates the light pulse. beacons afford all of the advantages of LED technology, which include a very long service life, much greater efficiency and unparalleled resistance to vibrations. In rotating mirror beacons, the light source is surrounded by a hemispherical mirror, which focuses the light point in a certain direction as it rotates, creating a rotating beam of light that attracts a lot of attention. The signalling effect can be improved even further by adjusting the speed of rotation. Flashing beacons attract attention by the light source being switched on and off periodically. Given that flashing light stimuli are more clearly visible than those that are constantly on, they are ideal for applications for which the extreme warning effect of a strobe beacon is unnecessary yet good visibility is still required. The flash frequency of flashing beacons is usually 1-2 Hz. Steady beacons emit a constant light signal and possess the weakest signalling effect of all of the visual signalling equipment. Steady beacons are put to use in situations where only low-threshold signal pulses are required or an information signal needs to be emitted. Using Fresnel lenses means that the light point in a beacon is distributed across the full height of the lens, creating an optimal signalling effect and good side emission. 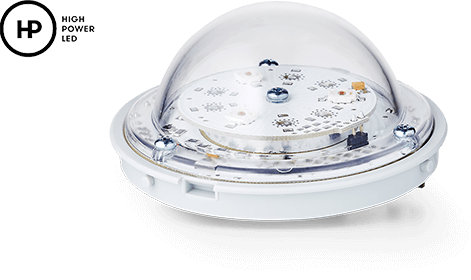 Most rotating mirror beacons feature smooth lenses to ensure that an optimal signalling effect can be achieved. Light transmission is reduced in some cases compared to the clear lens due to the use of different lens colours. In the field of signalling technology, there are different basic quantities that are used to evaluate light. The main standard units of measurement are lumen, candela and lux. Luminous flux is a measure of the total visible light emitted by a light source. It expresses how much light is emitted by a light source in all directions. This value is weighted according to human spectral perception. Luminous flux is an excellent way of expressing how effective a light source is. Luminous intensity expresses the light emitted in a certain direction. As the emission characteristics of visual signalling equipment are determined by the design of the lenses as well as by the light source, luminous intensity is ideally used to characterise the signalling effect of visual signalling equipment. Luminous intensity is therefore a measure of the spatial distribution of the luminous flux. The technical definition of a candela is the luminous intensity of a light source that emits monochromatic radiation that has a frequency of 540 x 106 Hz (corresponding to a wavelength of 555 nm) and an intensity of 1/683 W per steradian. A standard candle emits light with a luminous intensity of 1 cd, which means it emits 12.556 lm in all directions. Illuminance is a measure of the brightness with which a surface is illuminated. Illuminance expresses the amount of luminous flux from a light source that is incident on a receiving area per area unit. The luminous intensity depends greatly on the light source used. LEDs (light-emitting diodes) are optical semiconductors that convert electric voltage into visible light. LEDs have a very long service life, which is generally specified as more than 100,000 hours, equating to a continuous burn time of 12 years. After that point, however, LEDs do not stop working entirely and instead the light they emit will be reduced by around 30% compared to the usual luminous flux. The light emission merely decreases. Besides the service life, the other main selling points of LEDs are the fact that they require maintenance, their resistance to vibrations and impact, and their low energy consumption. For those special applications that require exceptionally good brightness, Auer Signal offers high-power LEDs and high-performance beacons alongside its standard LEDs. These products have been developed specifically to achieve maximum light output. Owing to the increased output that is within the limits of the LEDs' capabilities, the high-power LEDs require more power and generate more heat than standard LEDs. As a result, the service life of a high-performance beacon is restricted to around 30,000 hours. However, when power and high performance are essential, the reduced service life of four years is a small price to pay. Within the scope of the products developed by Auer Signal, the high-power LEDs are combined with lenses with a special optical design. Thanks to this combination of high-power LEDs and visually perfect lenses (refraction), signalling equipment ment from Auer Signal provides maximum light output and signalling effect. This can be seen in the 90 mm N series beacons and the Q series beacons, for example. Full resistance to vibrations, impact, shocks, etc. By applying a sufficiently high voltage in a bulb filled with the noble gas xenon, a very intense light pulse or flash of light is generated as a result of sudden discharge. Xenon beacons are still used in any situation that requires the brightest of light signals. No other type of beacon can compete with the absolute luminous intensity of a xenon beacon. A filament of tungsten wire is heated to a high temperature, which causes it to emit energy across a wide wavelength range, including in the visible range. Incandescent bulbs are now mainly used when low maintenance is an important factor and when the initial outlay is more of a concern than energy consumption. by vibrations, impact, flashing operation, etc. Halogen bulbs follow the same basic technology as incandescent bulbs. The difference is that energy is emitted as a result of halogens being heated to a high temperature rather than a tungsten wire. Service life reduced by vibrations, impact, etc.